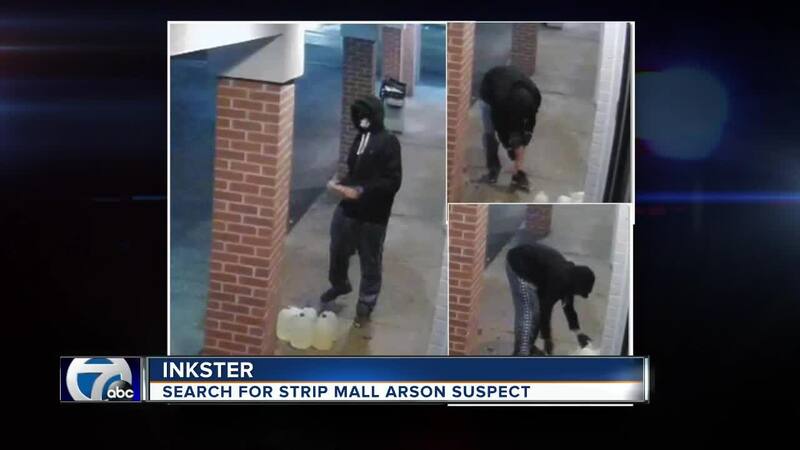 INKSTER, Mich. (WXYZ) — Inkster police have released surveillance photos of a suspect wanted for arson at a strip mall on Sunday. The fire happened at a row of stores at the mall, and now, police are searching for that suspect. He was caught on camera with several jugs of gasoline right before the fire happened. The suspect is described as a male with light complexion, about 6-feet to 6-feet-4 weighing 180-190 pounds. Anyone with information is asked to contact Detective Shafer at 313-563-9850 Ext. 23125 or bshafer@cityofinkster.com – Any tips can remain anonymous.